The powersports industry sees a number of fantastic events throughout the year. For dealers, consumers, vendors, OEMs you will find something for everyone. And the recent Tucker Rocky | Bikers Choice Expo in Frisco, TX did not disappoint. It was also a celebration for the 50th anniversary of Tucker Rocky so they pulled out all the stops. Over 1500 attendees and almost 800 dealerships were on site for a very business-driven couple of days. Product companies, service providers and many others had the opportunity to have much needed one-on-one time with dealers to discuss the latest in innovation and products. For the mobile-minded folks, I was very happy to be available to discuss mobile marketing and specific solutions to help dealers improve or enhance their dealerships reach and access to their passionate customer base. I was also excited to see vendors with mobile-specific products that cater to the “mobile” motorcycle customer. Products like RAM Mounts that allow customers to position their mobile device in a safe, easy to view place on their bike is very innovative. From a simple smartphone to a medium-sized tablet for GPS you can have your mobile device in arms reach for any ride you take. The long line of products they offer illustrates the customer demand for ways to keep their mobile device close at hand at all times. The helmet world has an amazing solution for mobile customers as well. I had a chance to check out the Cardobooth and the very popular wireless technology for communicating with your riding group. In addition to staying in touch with other riders it also gives you the ability to stream your favorite music, get GPS/Directional alerts, and even jump on that conference call from work without anyone knowing your not sitting in your office. Now that’s what I call going mobile but staying connected. Aside from the latest hardware attendees had the opportunity to sit in on the educational seminars conducted by Tucker Rocky and industry experts. Seminars like “Social Media & Going Digital” were very well attended and gave dealers great direction on how to better position their dealership on social media. As most of you know the overwhelming majority of social media traffic takes place on mobile phones. So this session was much needed and saw many great questions from those in attendance. Visiting with the team from CDK Global about Lightspeed was also very worthwhile. I learned that dealers need assistance in leveraging their data in more effective ways. Many dealers don’t understand the opportunity they have with reaching their customers already in their database. The Lightspeed team educated me on ways dealers can be more proactive in using their data by syncing up with mobile platform systems and give dealers the immediate access to their customer base via mobile without any extra effort. In an ideal world we all want systems to talk to one another and Lightspeed is making that effort to better serve dealers by allowing the process to happen at an incredibly affordable cost. As I interacted with more and more dealers during the Expo it was very apparent they are hungry for ideas and better ways to engage their customers on the mobile landscape. Many seem to have some strategy but not always thought out to a point of being able to measure the success of the plans. Measurement is so critical in any form of marketing. But maybe most important when your are trying to reach a very targeted, segmented customer base for what may be only a few minutes of their attention. So it goes without saying dealers are on notice by customers to get it right the first time. Another very enlightening aspect of meeting so many dealers was that small dealers have a mindset they can’t afford, or don’t have the resources for, a really good digital marketing strategy. After speaking with them and answering their concerns over where to direct their marketing dollars they began to realize they can make a serious impact on their customer base with a very small investment. A few dollars to boost a post on Facebook or sending a text alert can show a huge return on investment. Dealers understand they have a product or service customers are passionate about and even in small doses they can engage more customers through a digital strategy than they ever could through traditional media. Plus, they can compete on a much more even playing field with larger dealerships when it comes to digital placement. Any time you have an opportunity to learn and better serve your customers it’s very beneficial. Tucker Rocky | Bikers Choice did a great job of putting dealers with industry experts to help make this conversation more open and helpful. I look forward to more opportunities like this and hopefully meet more of you in the coming weeks/months. 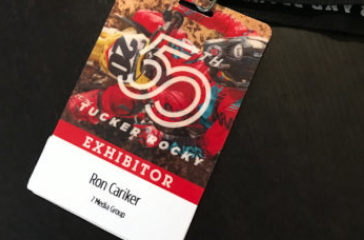 Ron Cariker is owner/president of 7 Media Group, a diverse mobile marketing firm based in the U.S., and the leading mobile provider for the powersports industry. Ron and his company have worked with over 100 dealers across the U.S. for the past 7 years. He speaks extensively across the U.S. and internationally about the mobile industry and mobile education.